The triangular block between Ditmars, Myrtle and Broadway. Via Google Maps. 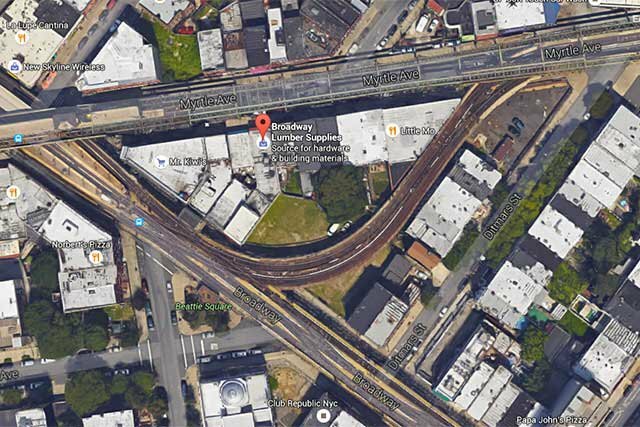 Some residents and businesses located on the triangular block under the curved M train track adjacent to Myrtle Broadway will need to be out of their buildings during upcoming work on M train tracks, according to Newsday. Moreover, the affected parties were not informed about the need for relocation for more than a month after the MTA finalized their plans to move them. Newsday obtained a document from MTA, according to which Newsday says, "dozens of residents" as well as a coffee shop and a bicycle shop will have to relocate for for six to 10 months but "possibly longer." The coffee shop and bicycle shop on the block are, respectively, The Other Little Skips (formerly Little Skips Outpost) and Harvest Cyclery, both of which are located at 1158 Myrtle Avenue. Lillian De Jesus, the secretary for 1158 Realty Incorporated, which owns the building, tells Bushwick Daily that the company had yet to hear anything about the shutdown from the MTA. Linda Thach, the owner of both The Other Little Skips and Little Mo, the Asian-inspired restaurant next door between the coffee shop and Harvest, tells Bushwick Daily that she would have lots of concerns about a shutdown. "If we had to close down it would be really sad and I worry about the employees who depend on us for their livelihood. I wish I knew more firm details. It's really making it hard to plan when the city has not reached out to us yet." AJ Nichols, the owner of Harvest Cyclery, which opened its Myrtle Ave location a little more than a year ago, tells Bushwick Daily that the situation is "a mess." Neither his lawyer nor the employees of an eminent domain firm he contacted have been able to identify the correct contact to address the situation, and he says that one of his business' neighbors, a tenant, received notice about the relocation instead of his landlord. "When the train's down, you would want to ride a bike, but oh well," says Nichols. Bushwick Daily has reached out to the MTA for additional details and will update as they are received.